The success of a leader, a manager or an ambitious employee depends largely on the mindset that he or she operates on. When we are in a positive state of mind we can focus on our goals and collaborate and communicate in positive ways which inspire and motivate others to help us succeed in our goals. It is unfortunately also possible for us to get pulled away from the positive state of mind when we are in high stress situations for a long period of time and when we allow ourselves to go down a spiral of negative thinking. Successful leaders and managers have learned how to quickly realize when this happens and to start implementing corrective actions and adjustments to their way of thinking to help them rapidly get back to a focused mind and closer to the outcomes that they are planning on. 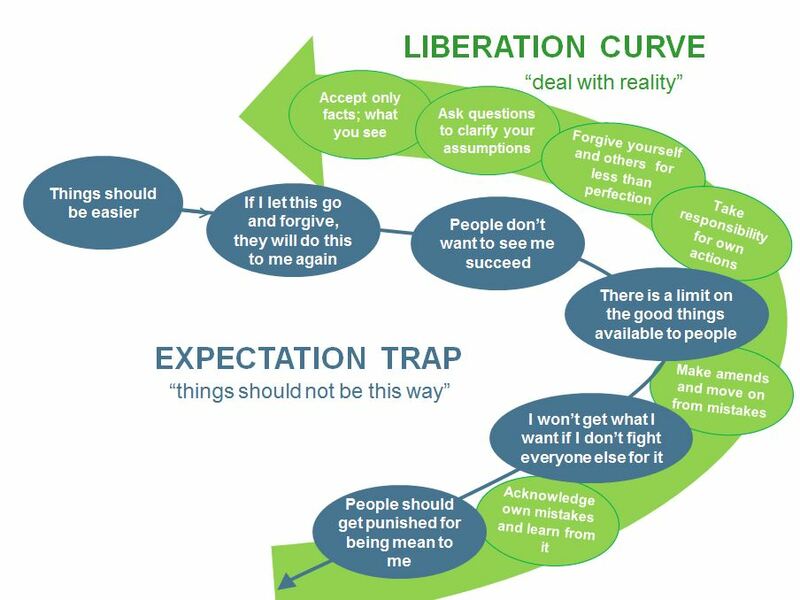 This model shows the blue path which I call the Expectation Trap or summarized as the kind of thinking that believes “things should not be this way”. This kind of thinking very easily moves us out of a positive mindset and it is aligned with going against reality. We wish that reality was different and we build this on our expectations of how good things should be and how badly others are acting or behaving as if others are actually causing the negative outcomes which we do not want to see. The green curve is the way out of the negative thinking. It is a different mindset which aligns with 1) doing a reality check and using that as the basis for moving towards a better way of thinking, 2) learning from the past, 3) changing or improving the plans we had before something happened to interrupt our progress and then 4) moving into the new direction with a positive focus and determination. The first step is often the toughest and once a person is in a negative state of mind it is really hard for him or her to realize this. If you have used a reality check worksheet a few times you will get better at recognizing the signs without having to complete the Realty Check Worksheet. Use the outcomes from this worksheet for further discussions with your mentor/coach or adviser. It may be that you need some coaching or just someone to be a sounding board for you as you talk through the situation and how to resolve it in the best way. Be sure to really connect with the negative feelings when you complete the worksheet. Some people are really good at being able to temporarily switch off their emotions to focus on business – but for this form, do make sure you are connecting with how it feels inside of you when you think about that situation or event that had caused you to feel pulled away from your positive mindset and down the Expectation Trap. Do take the steps necessary to resolve any upsetting situation/event. There is nothing worse than unfinished business behind you. It slows you down and drains you of positive mental energy that you need to accomplish the goal(s) that you have set for yourself. Your coach/mentor or adviser can help you with that if you are not sure how to resolve the upset so you can leave it behind you. Making decisions is a key part of any leader or manager’s day. Most new leaders find this somewhat intimidating. There is the fear of making the wrong decision, the fear of not having enough time to make the decision, the fear of not having enough information to make the decision and the list goes on. 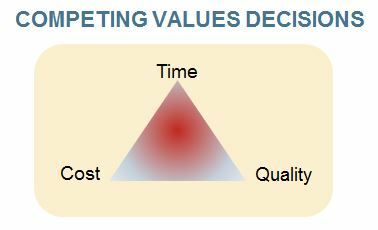 When it comes to commercial and operational decisions most of the time the difficulty in decision-making lies in the correct trade-off within the benefits triangle (shown to the left). If you can get the article/outcome within the time-frame that you would like and with the right quality that you would like to have, there may be a high cost trade-off. Similarly you can find yourself having a low cost at the right quality, but you may have to wait longer to receive the outcome or article. Understanding the trade-off as shown in the graphic above may make it easier to decide which of the three are non-negotiable and where a compromise may be appropriate. Another challenging area for decision-making can be competing values. Imagine you value employee development (as a leader or manager) and you also value productivity. Choosing to develop your employees typically means you have to take them away from their daily activities to attend a development or learning event. This implies they are not able to produce the results you need during that time. This kind of choice often comes at the last minute. Imagine you had planned for Employee A to attend, but at the last moment he or she is out sick or otherwise unable to attend and HR asks you to nominate a substitute and thereby presents you with a decision-making dilemma. 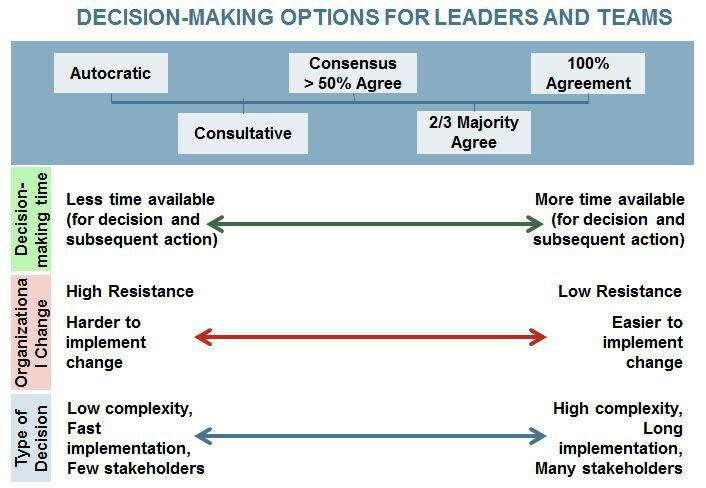 The graphic shown the the left illustrates some competing value trade-off decisions that you may be called upon to consider as a leader or manager. 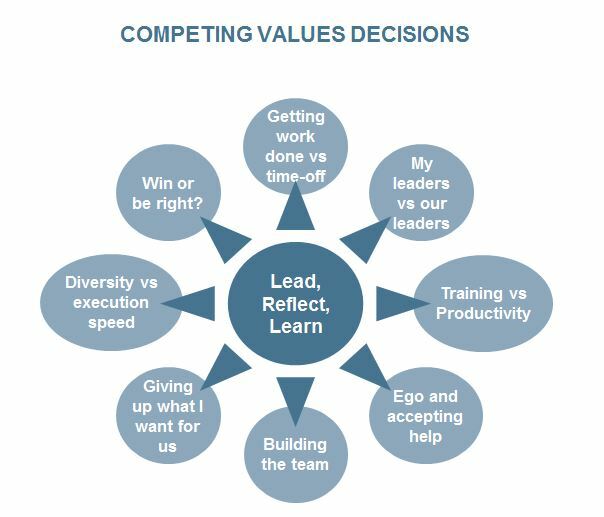 If you have already completed a review of your own values as a leader (Determining your own Values template) you may have the advantage of using that as a framework for decision-making. You would also need to look at the values that the company represent to make sure your trade-off options also include that perspective. Finally when you do make a decision, be sure to explain your reasoning and make the values you are honoring clear to the impacted employee(s) or colleagues. Leaders and managers also often fall into the trap of trying to use only one decision-making style and they neglect to consider the other options open to them. There is a time and a place for every type of decision-making style. Sometimes it may be appropriate to make autocratic decisions – this can be useful when the impact is limited, the need is immediate and the risk low of encountering resistance during implementation. At other times a more collaborative and inclusive decision-making process may be appropriate – such as when there are many stakeholders, people need to change their behaviors or work methods, time is on your side etc. Selecting only one decision-making style as a leader can make decisions difficult since you may find you experience a lot of resistance from others to implement your decisions especially if you favor autocratic decision-making most of the time. The main job of a leader and a manager is to make decisions and choices in order to move projects and initiatives forward, deal with risks and unplanned barriers to success and achieve the goals and objectives for the group/team or company. Many new leaders and managers need to learn how to make decisions and these models and pointers shared here may be helpful as new skills and confidence in decision-making is being learned. Before you can select goals and objective for your life and your career, you need to know what you value above all else in your life. You could not even select priorities for your time or how to use your efforts and energy best if you did not have clarity on what your values are. This is also true for leaders, managers and others who like to plan for the successes they intend to achieve. Values drive how you spend your time and how you make choices and decisions for activities and events that are important to you. Your values are especially helpful with choosing between two options – events to attend, how to prioritize activities, which actions to take next etc. When it comes to decision-making: select options that mostly align with your values and refrain from choosing options that are not aligned or even opposites to your values. This template can help you define your own values; it contains a list of statements to guide you on your quest. Instructions on how to use the template can be found at the top of the worksheet. First you read through the statements and then put a Y for yes in the first column to indicate those statements which most appeal to you on an internal value scale. (It seems or feels right to you; knowing yourself and what you find important in life). The next step is to look at only the ones you have selected with a Y – put a score between 1 and 10 next to the selected items using the column to the right of each statements to indicate how important that selected statement (representing a value) is to you. The highest scores indicate your highest values. Rephrase or clarify any of the value statements so that you can be 100% sure to remember it correctly a few days or weeks down the line when you review the list of your top values. Feel free to add more statements or words at the bottom of the list if you think of values that are not shown. I find that these lists are good at helping one start-up the process and then your own ideas and words start to pop-up which then enables you to complete the process without using the listed guiding statements. Once you have your list of top 5 values, check that against how you spend your time and ask yourself if your choices reflect your values or not. If they do, great. If they do not, what will you change to ensure you spend your time in a way that reflects your values better? Look at those who are close to you next. Are you surrounded by people who share your values or do they have different values? If their values are aligned with yours, great. If their values are not aligned with yours, what will you do to ensure that you are able to live up to your own values? Your job and the company you work for/the office environment – do you feel that your values are compatible with the environment and what the company is trying to achieve? Are people (employees and customers) being treated in a way that you feel is aligned with your values? I am not suggesting that you resign tomorrow if there is a disconnect between your values and status quo. Instead I would like to pose a question… what can you do to positively impact how things are being done right now? And what do you think are the best steps to take if you do not see any improvement over time or a better alignment with your values? It is not easy to hold yourself accountable in this way; knowing what your values are and being honest with yourself about how well your life choices align with your values. It is possible that some people will get upset with you when you consciously start making different choices with your time and the things you are interested in or willing to do. The benefit of making decisions with your values in mind is that you will be able to take a more direct line to accomplishing your goals. This will impact time management, prioritizing preferences and cutting out those items that distract you from achieving the goals and objectives that you have set for yourself. How you choose to spend your time is a good indicator of the activities and people who are most important to you in your life. It shows your priorities clearly. How well do your daily activities reflect your priorities? 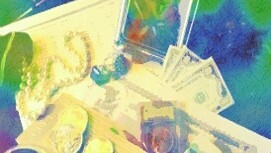 Personal Development. It is possible that you have considered taking an evening class to improve on your education or skills levels, but you are not sure how you will find time for attending that class given your busy life. Taking a closer look at how you spend the time that you do have may help you see opportunities for changing your weekly or daily schedule in order to make time to address your own development needs. Leaders and managers have many priorities to manage and often feel there not enough hours in every day to accomplish the business objectives they have set for themselves and their teams. Taking a close look at how you spend every day and every week my yield some interesting insights. You may discover areas where you could refocus yourself or delegate activities to free up more time to maximize your own productivity in more important areas. Performance feedback could be indicating that your supervisor/manager feels you are not using your time at the office in a productive way. This template can also help you discover where he or she may be right and whether you are actually using your time optimally to achieve the performance goals that you and your boss have agreed upon. The tool I am sharing helps you to take stock of what you are doing with all of the time that you have available to you. I once discovered that 30% of my time was at my own discretion and I created a mantra for myself “make the 30% count.” Whenever I caught myself involved in an activity which I had labeled as of low value to me given my own goals and values, I would just remind myself of the mantra and shift my focus to a higher value activity. Should you need more development in how to be more effective at work, I suggest you look for a class on time management tools. These classes typically focus on how to get better at email management, how to better plan your day to do the right type of activities at the right time of the day (energy management) and also how to get better at keeping track of your highest priorities and making sure that you are working on the right items at various check-in moments with yourself during the day. I hope your efforts to take a closer look at how you spend your time has given you the awareness of how much time you have available to spend at your own discretion. Are you using your time wisely? Are you doing things that will get you closer to the goals you have for your life? I found one has to repeat these quick checks on a regular basis – maybe every 6 months – to make sure you are still on the path you had set for yourself when it comes to being in charge of the time you have. One of the most frustrating elements of many managers’ calendars are meetings. If you ask people they typically feel there are too many people present, the meetings take too long, some individuals talk too much, many people are off-topic and unprepared plus there are no or few decisions made which leads to a general feeling that there is no clear agreed path forward. This tool I am sharing helps a chairperson to prepare for a meeting and communicate the specific objectives of the meeting and also for every agenda item. Some of the meeting maladies mentioned above can be cured simply by creating and distributing an agenda before having a meeting. This tool goes further though – it also helps to create clarity around each agenda item’s purpose in informing participants or driving specific decisions to move a project or initiatives forward. The tool already contains an example to illustrate its use. 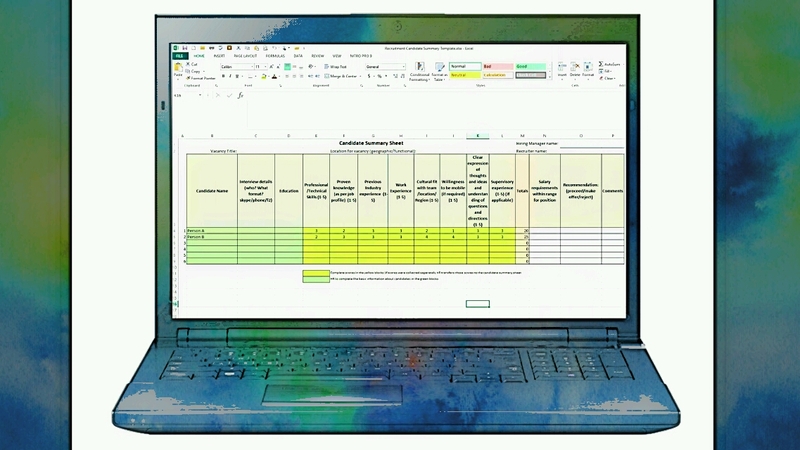 Just replace the agenda items shown with your own meeting agenda items and then complete each column as demonstrated to clarify the person responsible for the agenda item, the purpose of each item, the allocated time and the expected outcome for each of the agenda items. Do share the objectives, time available and expected outcomes with those who are assigned to each agenda item – it helps him or her be prepared to guide the conversation and discussion accordingly. Even with an agenda and a well-planned meeting there may be times when things need to change as it becomes clear that an issue requires to be solved right-away. Give yourself the leeway to abandon the agenda for a particular meeting to deal with such an important issue or set another meeting right after the planned meeting to address the issue. To continue with a planned meeting simply because it was planned makes no sense if everyone in the room knows that an important issue is not being addressed and there is no plan to address it urgently. Their minds would be on the other issue and you would most likely not have the level of participation you need to successfully go through your planned meeting. To know if your meetings are getting better – get feedback from your meeting participants. 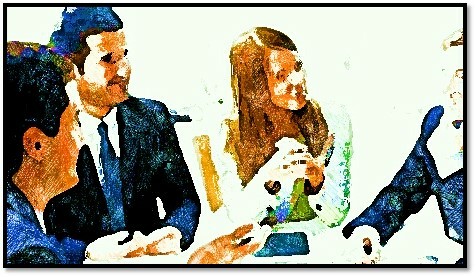 Take a few minutes at the end of the meeting to ask what went well and what could be better in future – exactly how. Reviewing the feedback when you plan the next meeting can help you to be mindful of further improvements that can be included going forward. I hope this tool helps you plan your next meeting and move closer to having productive meetings which helps you progress your project or initiative as you had hoped. 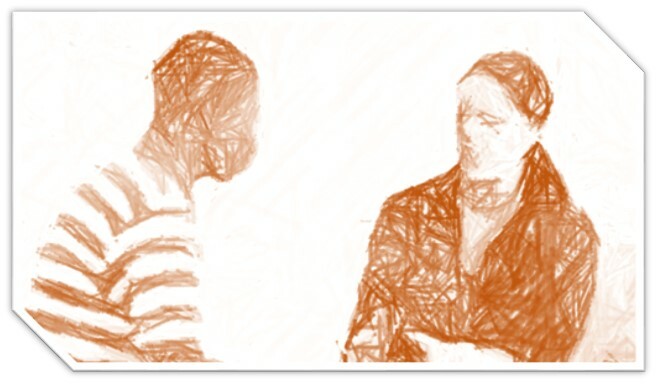 Giving and receiving feedback especially around undesired behavior can be a daunting task. Not only is it typically hard for employees to hear corrective feedback, but it is also typically hard for managers and supervisors to give that kind of feedback. It nevertheless remains an important part of ensuring that performance expectations are set and met. This template helps a manager or supervisor think through the important aspects of giving feedback to an employee and helps to plan the actual feedback meeting. The template and approach also helps plan positive feedback to employees. This aspect is often neglected, but equally valuable in helping employees understand what specific actions and communications are valued and should be continued. Never give important feedback via an email or sending this worksheet to the employee. It should always be done in person or at least by phone or skype – if you have remote team members. The feedback should be given as soon as possible after the event to minimize surprises at the annual performance feedback meetings and to ensure the employee still has a good recollection of the situation or event that took place. Do allow the employee to respond once you have shared the feedback to ensure that your message is understood and that you get an opportunity to understand any nuances which you may not have been aware of. It is always a good idea to agree on a check-in moment at some time in the future. This is an opportunity to see if the employee may have further questions or comments at that time or perhaps he or she worked on improving a particular skill and may have some successes to share. Effective managers know how to optimize the value provided by their departments and groups by effectively delegating tasks to their direct reports in a way that also continuously increases the skills and competencies of their direct reports. I am sure I was not the first new supervisor who had a hard time tracking who was doing which delegated task at a given moment. The template I am sharing is a great way to keep track of not only who is working on which delegated task, but also what was the overall purpose of the delegated task. Use the drop down list in column B to select the category that applies to that task/project and the person that you are delegating to. You can create more lines for delegated tasks by just inserting a line between the existing lines. Keeping this list up to date and referring to it in a regular basis will help you remember when to check in on someone working on a delegated task or project. You keep track of the reasons why you gave a specific task to someone – from a developmental perspective. This means you know how much support and coaching may be needed while the person is working on this task. Avoid giving the same task to more than one person. There is nothing more demotivating than finding out another colleague is working on the exact same project as you are after you have already spent several hours doing research and talking to people about the project in order to deliver a great result. You can do more and accomplish more as a manager when you don’t have to rely on your memory alone to remember who is working on which tasks and projects for you. There are a few reasons that employees leave companies and some of them may not be voluntary in nature. The exits that you were unable to plan for will mostly be the ones that cause you sleepless nights. What if one of your star employees suddenly resigned? What if a very successful leader in an important role suddenly decided to leave the company? I am sure your main concerns would be around the potential impact to the business and how could that have been avoided? Was it avoidable? Will others follow? The Exit Interview is a great way to gather feedback on employees’ decisions to leave the company and what next steps they are planning to further their careers elsewhere. This structured interview can greatly support your ability to narrow down the reasons for the exit and whether you have any large internal issues to address to avoid more people leaving the company. You could choose to use this as a survey which the departing employees complete independently. I would however recommend that you ask these questions as part of an exit interview conducted in person as it offers the opportunity to ask follow-up questions to clarify answers to make sure you really understand the factors that led to the decision to leave the company. There is a good chance that the departing employee may not tell you the truth. Sometimes they are afraid you may give them a bad reference in future if a prospective employer called you up. Other times they may be worried about being the whistle-blower on an existing organizational issue in terms of potential impact on any friends they still have at the organization. It may be worth considering the use of an outsourced vendor to gather feedback from departing employees before or just after they have left. Do take the time to review feedback received from exit interviews to determine whether you or anyone else at your company may need to take actions to improve a situation, revise benefits, improve communications to employees on specific topics etc. These actions may be exactly what is needed to avoid other employees from leaving for similar reasons. Mind confidentiality around these interviews. Be sure to be honest with the departing employee on who will get to know about the information shared and stick to the agreement. Talk to those employees who remain with the company and make sure they understand how much you value their continued service and loyalty to the team/organization. When a prominent person leaves – whether a subject matter expert or a much-liked leader – people may start wondering about their own careers and consider leaving too. 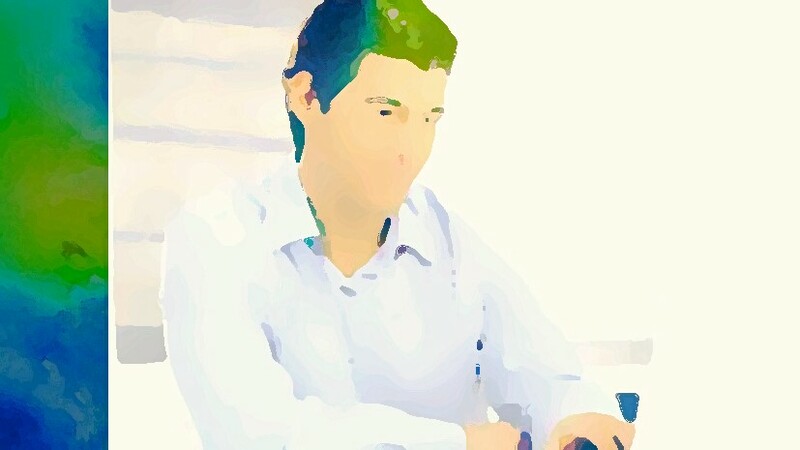 Taking employee retention actions and communicating especially to those in key roles will go a long way towards putting people’s minds at rest. It is never easy when you lose good employees and respected leaders and experts to the competition. The best you can do is make sure you learn from the event and take the actions you need to avoid recurrence of an unplanned exit. A New Employee survey is a great way to gather input in a structured way; answering the question : How successful is your on-boarding process from the perspective of the newly hired person? You should of course use the template I am sharing mainly as a guideline. I am sure you can think of items you would like to add or change or remove. The objective of the survey is to capture data over time to see if the changes you are making to improve on-boarding is gradually increasing the scores and yielding more positive responses going forward. If you track more than one location you can also compare the results to understand if there are any location-based differences in new employee experiences and how you can ensure a consistently great on-boarding process across all locations. Most of the time I see these kinds of surveys run on services like http://www.surveymonkey.com If you find it too daunting to setup such a survey online, use a paper copy of the New Employee Survey. The important part is to gather the data you need to enable decision-making and identify improvement actions to take around your on-boarding process. Don’t make the survey very long or you will risk lower response rates, questions skipped or repeated answers. Watch out for questions that seem similar which frustrates survey respondents. Make sure you are asking questions which would generate answers that can be actioned. For example I advise against asking “Did you feel good on your 1st day at the office?” If the survey respondent answered “no” you would have limited ability to impact the responses from future new employees. Do take the time at least once per quarter (or shorter time periods if you are hiring several people) to review, analyze and summarize the results obtained from the New Employee Surveys. That way you can be sure you are able to spot trends and identify specific focus areas for you and your HR/Learning and Development teams to address and improve upon going forward.